Evidence suggesting that mild to moderate consumption of wine protects against cardiovascular disease has been accumulating since the early 1990s. Now, however, researchers have shown that wine only protects against cardiovascular disease (CVD) in people who exercise. That was the finding of the In Vino Veritas (IVV) study presented at the European Society for Cardiology Congress in Barcelona on August 31st 2014 by Professor Milos Taborsky from the Czech Republic. Retrospective studies have found that wine increases levels of HDL, the “good” cholesterol. But until now there has been no long-term, prospective, randomized study comparing the effects of red and white wine on HDL cholesterol and other markers of atherosclerosis. The IVV study is the first long-term, prospective randomized trial comparing the effect of red and white wine on markers of atherosclerosis. The study included 146 people with mild to moderate risk of cardiovascular disease according to the HeartScore. Participants were randomized to one year of moderate consumption of red wine (Pinot Noir) or white wine (Chardonnay-Pinot) from the same year and wine region of the Czech Republic. Moderate consumption was the World Health Organization definition of 0.2 liters or 6.7 ounces for women and 0.3 liters or 10 ounces for men, a maximum of five times a week. The primary endpoint was the level of HDL cholesterol at one year. Secondary endpoints were levels of other markers of atherosclerosis including LDL cholesterol. Participants consumed their usual diet. Participants kept a logbook on their consumption of wine and other alcoholic beverages, medication use, and amount and type of exercise. They were required to return the corks from the wine bottles to confirm that they had drunk the wine rather than sold it. 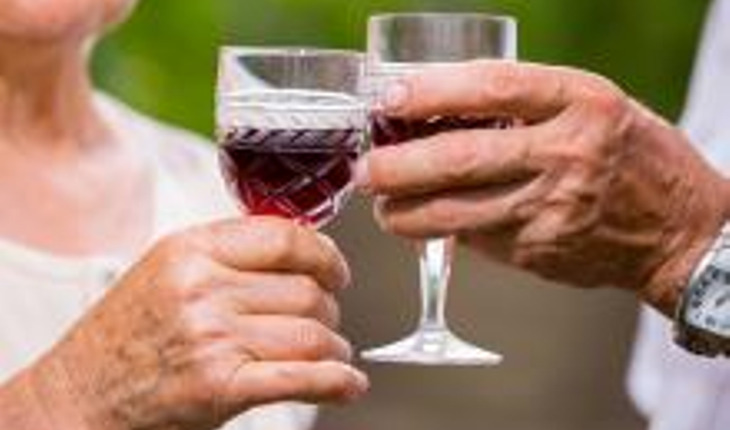 “A rise in HDL cholesterol is the main indication of a protective effect against CVD, therefore we can conclude that neither red or white wine had any impact on study participants as a whole,” Professor Taborsky said. “The only positive and continuous result was in the subgroup of patients who took more exercise, which means regular exercise at least twice a week, plus the wine consumption. In this group HDL cholesterol increased and LDL and total cholesterol decreased in the red and white wine groups. There may be some synergy between the low dose of ethyl alcohol in wine and exercise which is protective against CVD. “In a future study we will compare the effects of red and white wine on markers of atherosclerosis in patients at high risk for CVD who take statins and do regular exercise. We hope to find that moderate wine consumption is safe in these patients.